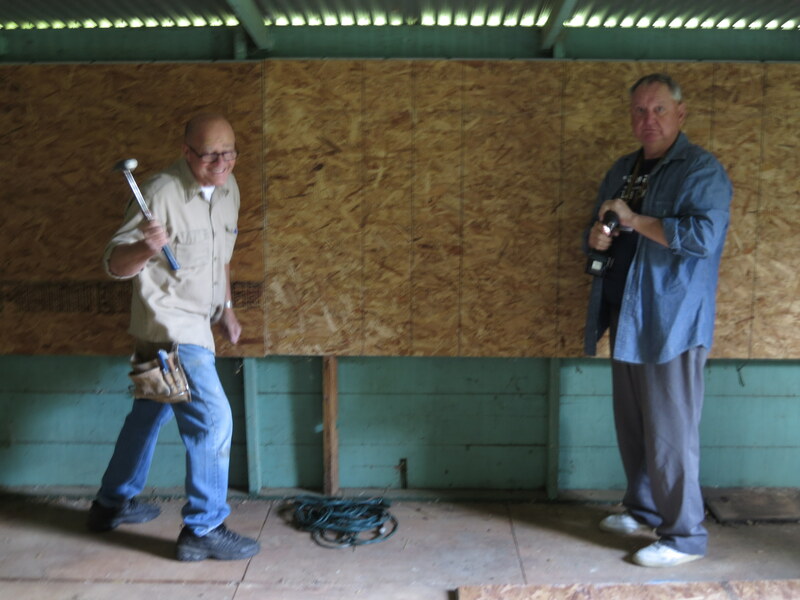 John Wiskirchen and Bob Reynolds set fence posts. 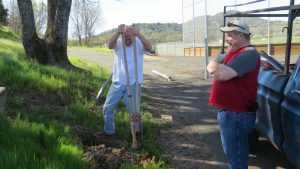 For the 2017 Kiwanis One Day, April 1, several club members reported to the Westside Community Park in Lakeport to complete some needed projects. Fencing was installed and signs were placed in various locations. 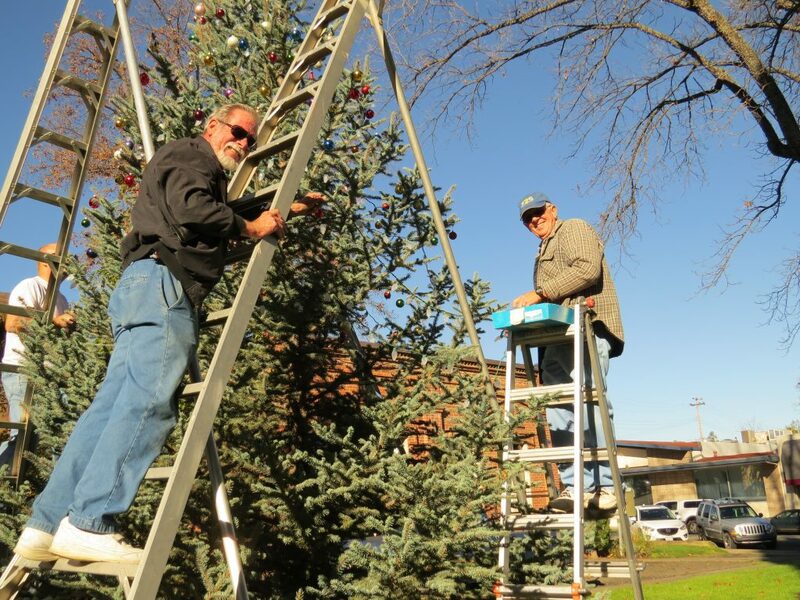 The Kiwanis Club of Lakeport has taken on many projects over the last several years to assist with the park’s development. 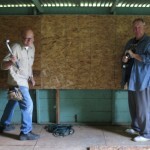 Mike Ewing digs a hole for a the “Dogs Must Be on a Leash” sign while Brad Rasmussen lends moral support. 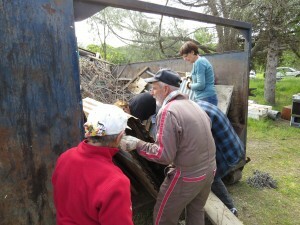 Members & associates load the 40 yard dumpster. 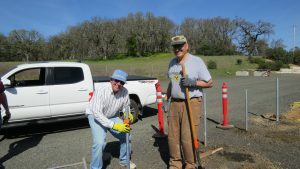 As part of Kiwanis International’s Kiwanis One Day where all clubs are called upon to provide service to their community, the Kiwanis Club of Lakeport worked at the Westside Community Park. 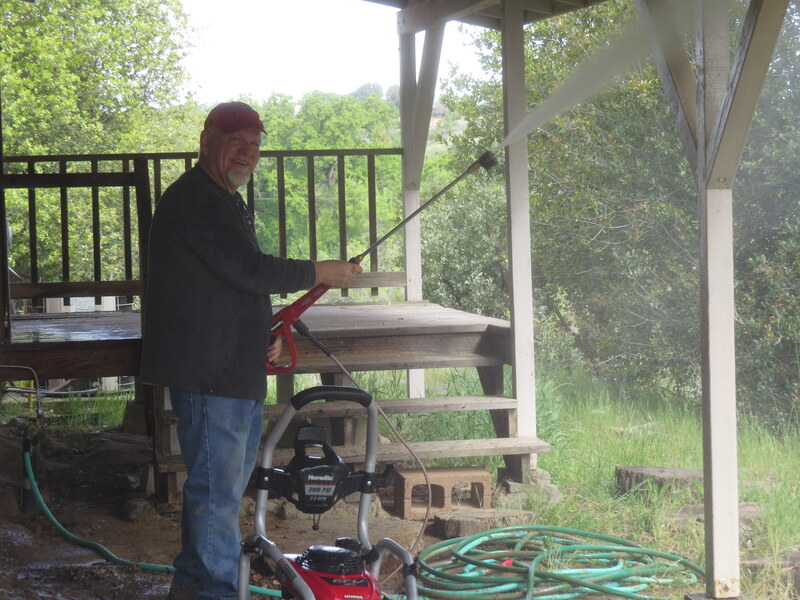 Wally Cox cleans up with the power washer. 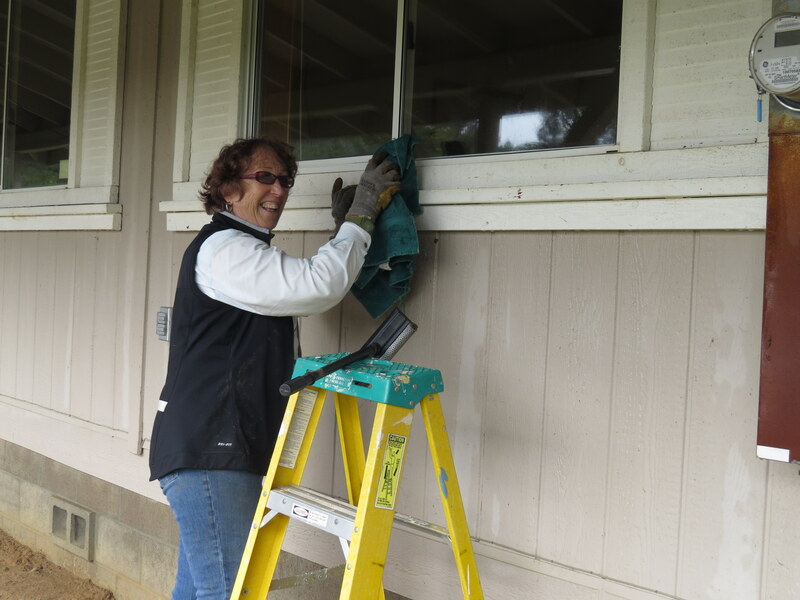 Fifteen members and associates came together to help prepare the newly acquire caretaker home and property for occupancy. 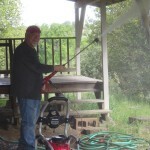 This involved power washing the house and installing screens, cleaning up debris (enough to fill a 40 yard dumpster), removing an old above ground swimming pool and trimming some trees. 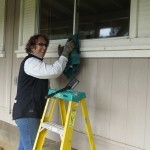 Jennifer Richardson washes windows at the caretaker home. 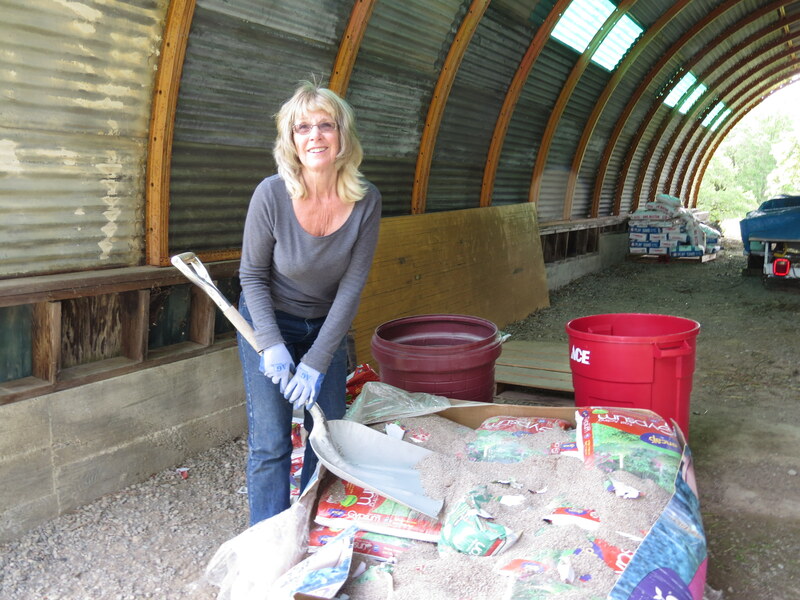 Additionally, a crew turned an old Quonset hut into a secure, locked storage unit. Member Mike Ewing and visiting future Lt. Gov. Greg Clegg from Santa Clara County board of window in the storage area. The work was followed by a picnic lunch. 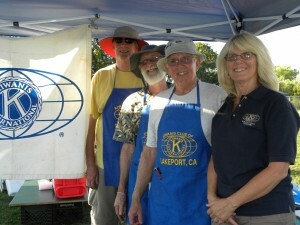 The Kiwanis of Lakeport sponsors or participates in several activities to support youth in our community. 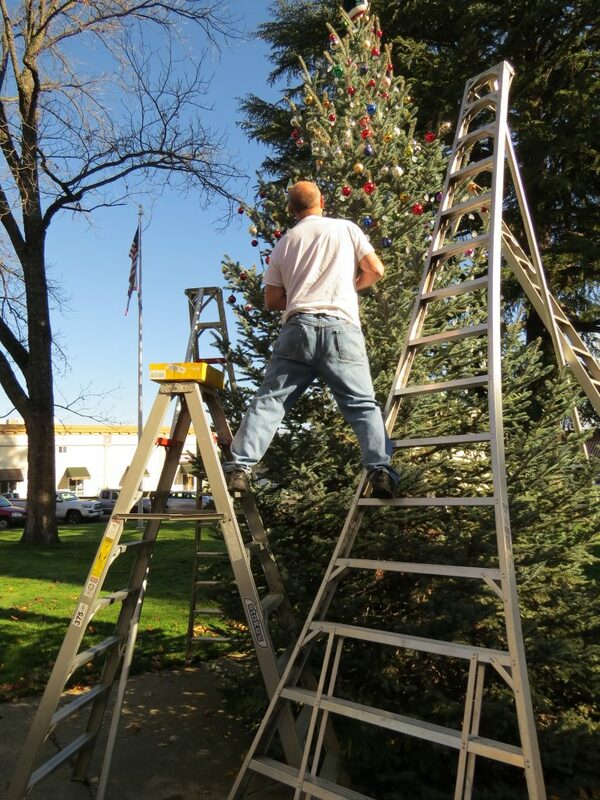 We also raise funds in support of our scholarship program. View the 2014 Scholarship Recipients and obtain application information. The pancake breakfast and craft fair scene. 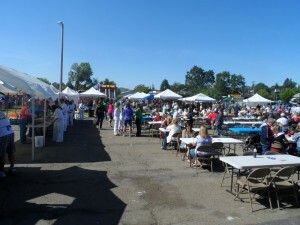 Each Memorial Day we serve a Pancake Breakfast to benefit the Lake County 4H Clubs. 4Hers and their parents provide table service. 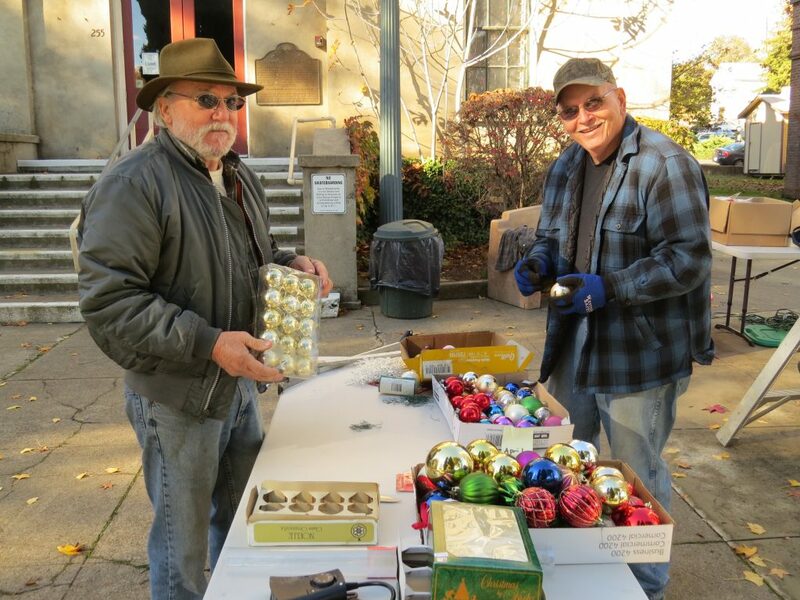 On Saturday and Sunday of that weekend the club hosts a Craft Fair. Master of Ceremonies, Mike Ewing, and judges view the parading costumes. 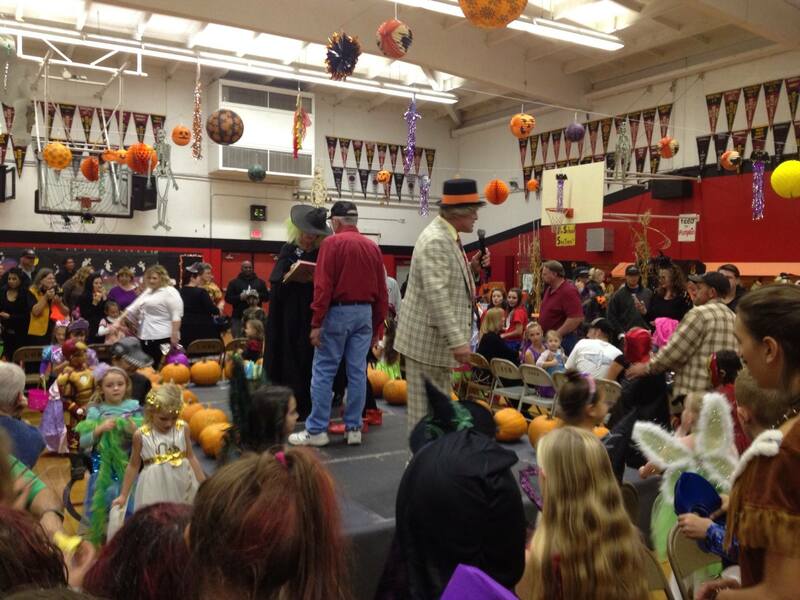 On the club puts on a Halloween Party for children and their families in the Clear Lake High School gym. The party includes Halloween themed carnival games, costume contests and guess the weight of the giant pumpkin contest. 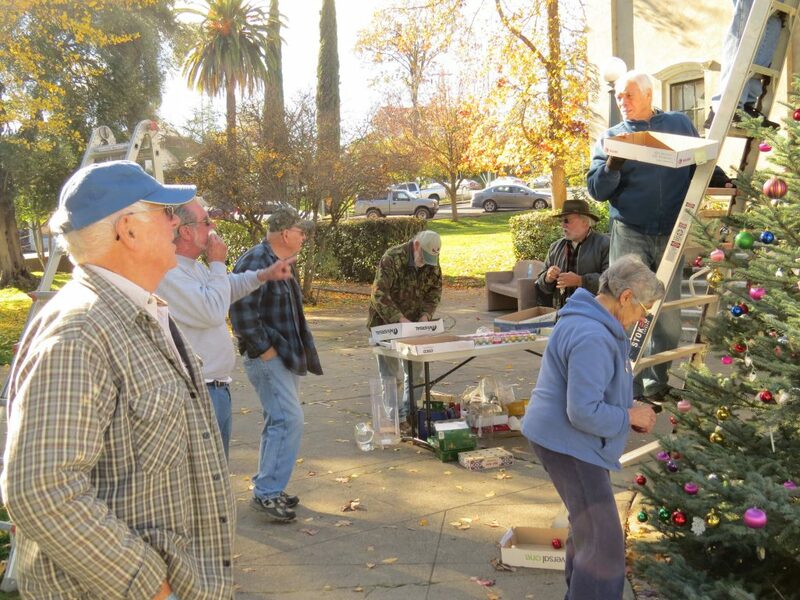 CLHS’s Scholastic and Interact Clubs and Kelseyville High School’s Interact Club operate the games each year. Attendance in usually in the 800 to 850 people range. 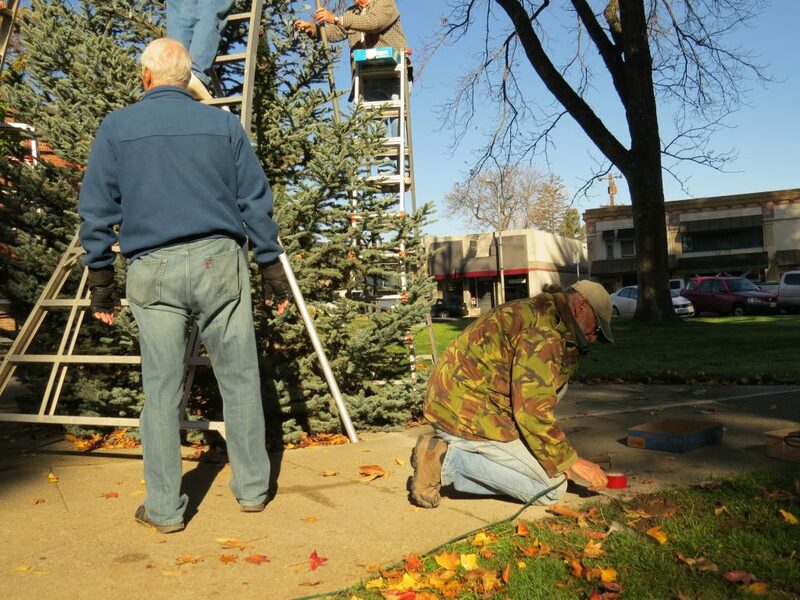 CHRISTMAS PROJECTS: Each Christmas Season the Kiwanis Club of Lakeport makes donations to the Clear Lake High School Christmas for Kids, the Lake County Christmas Basket Program, Wreaths Across America, decorating the tree in Museum Square in downtown Lakeport. 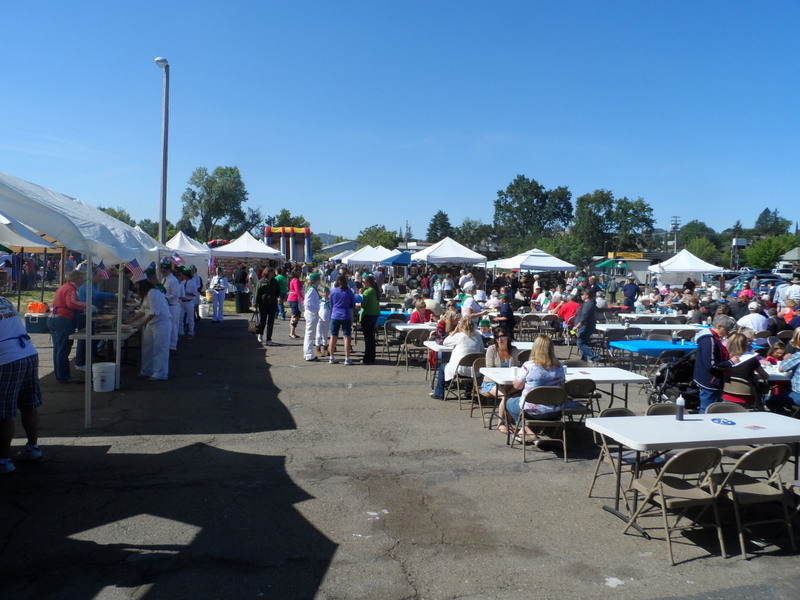 Each August, Club members serve delicious BBQ ribs at the Annual Grillin’ on the Green BBQ Cook Off fundraising event for the Westside Community Park Committee. 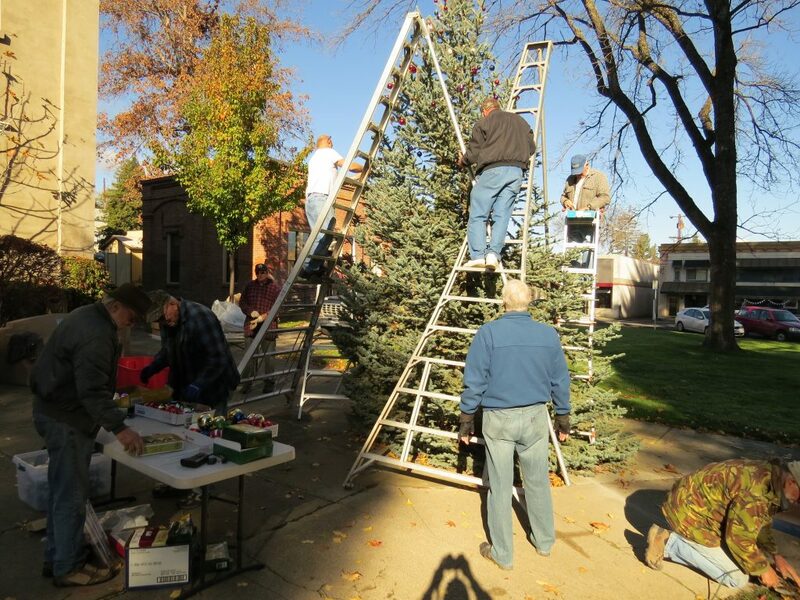 Support Clear Lake High School’ Christmas for Kids program. 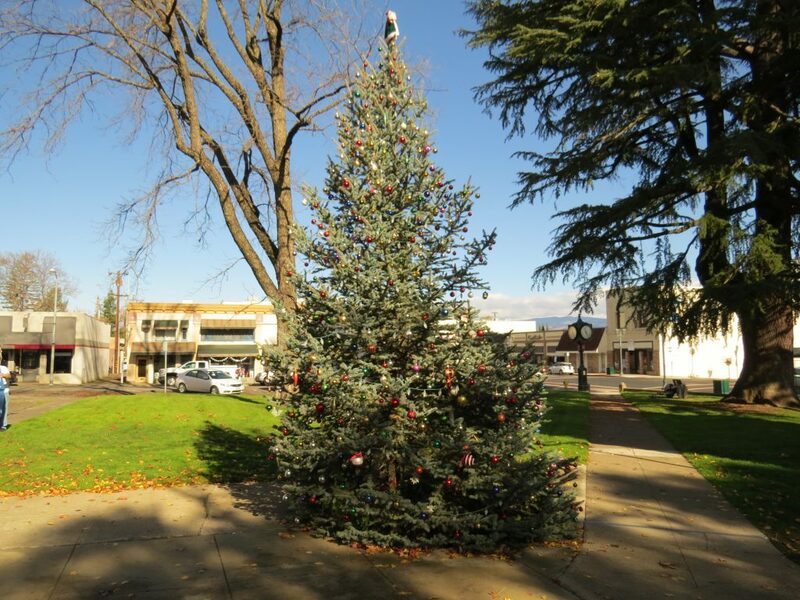 The Kiwanis Club of Lakeport occasionally receives requests to complete projects for various community groups. These requests are considered by the Board of Directors. 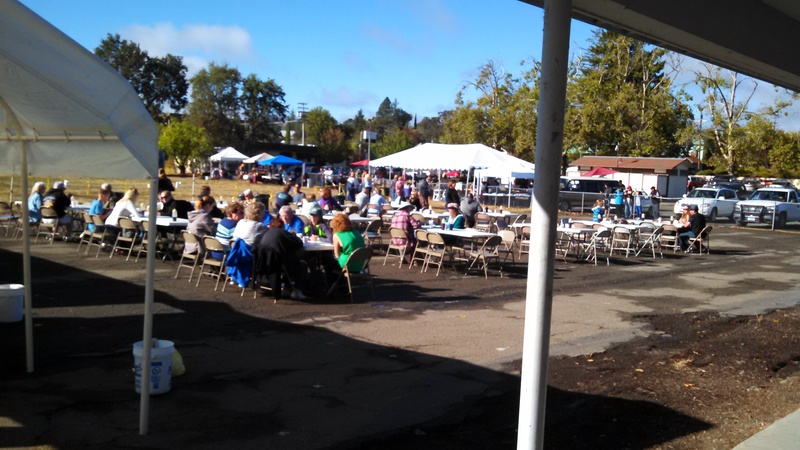 For the second year, on August 19, 2015 members of the club barbequed hot dogs for the Mendocino College, Lake Center Welcome Back lunch. Members doing the cooking were; Jennifer Richardson, Joyce Porterfield, Mike Powers, Bruce Brower, Val Schweifler, and Ross Kauper. Members of the Channel Cats Swim Team serve diners their breakfast. In September, 2014 the club prepared a pancake breakfast to support the Lake County Channel Cats Swim Team. Members of the team and their parents provided table service. 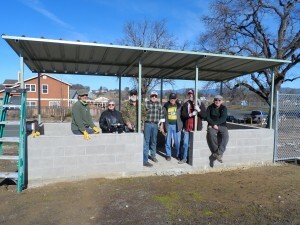 a Senior student’s project to construct a disc golf course at Clear Lake High School and remodeling of restrooms for People Services, Inc.
Club members have finished installing the roofs on the dugouts at the Westside Community Park. 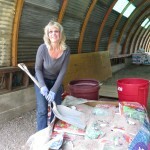 WANT TO PARTICIPATE IN OUR COMMUNITY ACTIVITIES?Check us out.